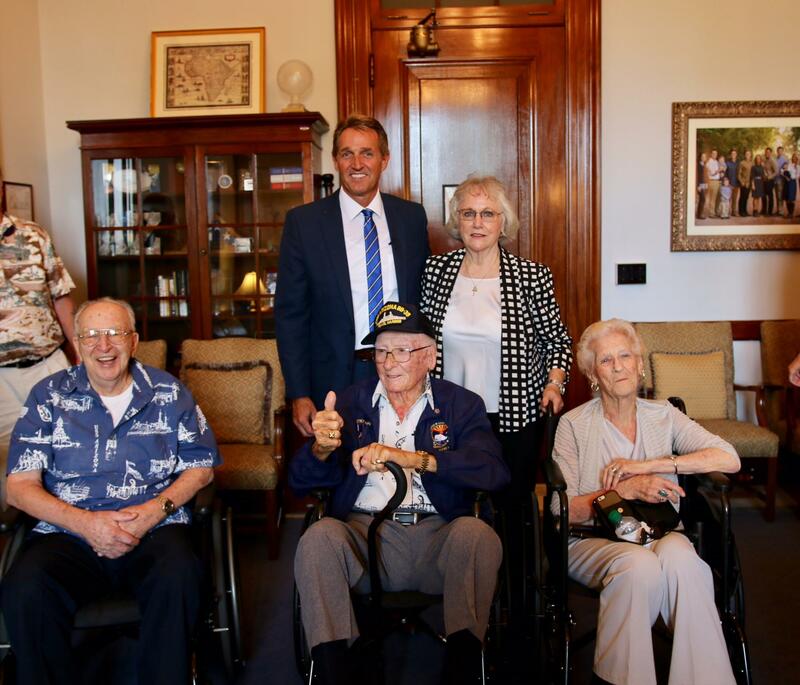 Sen. Jeff Flake spoke on the Senate floor to introduce a resolution honoring Pearl Harbor hero Boatswain’s Mate Second Class Joseph Leon George for rescuing six injured sailors from the sinking USS Arizona. The resolution also expresses the Senate’s desire that the U.S. Navy reconsider a past decision not to decorate George because he defied orders to rescue those sailors. George passed away in 1996 having never received official recognition for his life-saving actions at Pearl Harbor. George was serving aboard the USS Vestal, a repair ship moored alongside the USS Arizona, when the Imperial Japanese Air Service attacked Pearl Harbor on Dec. 7, 1941. When the Arizona suffered a direct hit by a Japanese bomb and began to sink, George spotted six severely injured sailors trapped in the Arizona’s control tower – Seaman First Class Harold Kuhn, Seaman First Class Russell Lott, Gunner's Mate Third Class Earl Riner, Boatswain's Mate Second Class Alvin Dvork, Seaman First Class Donald Stratton, and Fire Controlman Third Class Lauren Bruner. Defying orders to immediately cut the Vestal free from the sinking Arizona, George first threw a heaving line between the two ships, enabling the wounded sailors to climb 70 feet hand-over-hand across the line to safety. Two of those sailors would succumb to their injuries in the weeks following the attacks, while the four others would recover, serve honorably during World War II, and go on to live long lives. Stratton and Bruner, along with George’s family, and generations of children and grandchildren who owe their lives to George’s life-saving actions are now urging Congress to secure recognition for George. During a recent meeting in which Stratton and Bruner shared firsthand accounts of George’s heroism, Flake committed to spearhead the resolution. The resolution is cosponsored by U.S. Sens. Cory Gardner (R-Colo.), Mike Lee (R-Utah), Tom Cotton (R-Ark. ), Claire McCaskill (D-Mo. ), and Michael Bennet (D-Colo.). Flake also plans to submit the resolution as an amendment to the National Defense Authorization Act when it is brought to the Senate floor. Video of Flake’s remarks can be viewed here.